When you’re a small business, word-of-mouth referrals from your customers can be the difference between failure and success. 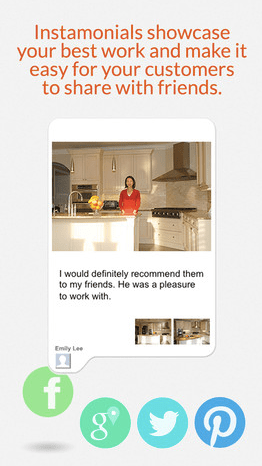 KnexxLocal‘s Instamonial combines great photos and great customer reviews to grow small businesses’ word-of-mouth referrals online. 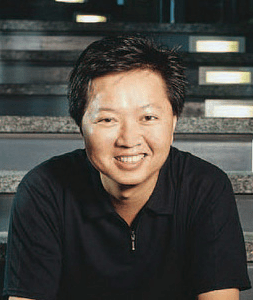 We caught up with Founder and CEO Paul Chen to talk Instamonial inspiration, fatherhood and dining with Ted Turner. Tell us a little more about what inspired KnexxLocal and the Instamonial app. Early on, when we first started thinking out the kind of business we wanted to build, the Groupon-style deal-of-the-day startups were getting a lot of buzz. We looked at that model, and were struck by the number of small local businesses that reported negative experiences and felt they were misled. It reminded me of when I was growing up and my parents owned a local convenience store. There was one time in particular when an ad salesman from a local television station convinced them to take part in an advertising deal. We all sat around the TV waiting for our commercial to come on – but it never did. When my parents called the next day, they found out that their “time slot” was 3am – they weren’t sophisticated marketers and it never occurred to them to ask when the slot would run. A lot of local businesses are now disillusioned by online marketing in the same way my parents were by the ad salesman back then. We decided that we wanted to help fix that problem by providing simple, yet effective ways for reputable local businesses to access online marketing. Since word-of-mouth referrals have always been the most effective form of marketing for local businesses, we set out to find ways to move those referrals online, and in turn make word-of-mouth more efficient. That’s how Instamonial was conceived. Best/most challenging part of being an entrepreneur? Honestly, I never really set out to become an entrepreneur. Growing up, I thought I might become a professor because I love trying to find solutions to problems. As it turns out, as an entrepreneur, I am constantly facing new problems that need to be solved, which is really rewarding. Even better, I get to choose which problems I want to solve – and I get to work on things I’m passionate about solving. Helping local businesses with online marketing is a great example. For me, the hard part comes in staying focused on a single problem – I tend to be constantly looking for bigger problems to solve, to keep challenging myself. I know I need to keep that in check, to find a good balance. 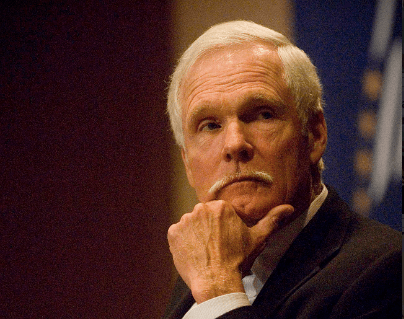 I’d like to have the chance to meet Ted Turner and pick his brain. I read an interview recently where he said that when his father came out of the navy in the 1930’s, he set a goal for himself to make enough money to join a country club and get a sailboat. And he said it was the biggest mistake he ever made, because once he achieved it, there was nowhere to go from there. His message was that you should find and set goals for yourself that are big enough – unachievable enough – that you can stay passionate about them forever. That message really resonated with me – I think in the past, and in my other businesses, the problems I set out to achieve were somewhat limited, and when we figured out how to fix them, I started looking for something more. It’s also why I’m so excited about the path we’re on with Instamonial and KnexxLocal. Helping local businesses – essentially “helping the little guy” – to grow their business through marketing is a challenge that I can stay passionate about, and keep working towards indefinitely. The world of marketing never stops innovating – you don’t have to go too far back to find a time when direct mailing was innovative, then email came along. Nowadays social marketing is the thing. It’s safe to assume that in ten years the focus will be something else. I’m betting on the fact that there will always be new challenges in helping local businesses to succeed through marketing. It’s funny – if you asked me this when I was younger, I would have answered this differently. When I was building both of my previous startups, there really wasn’t much of an “other parts” of my life; the business was everything. Having children changed that – and changed me in the process. As the parent of young kids, I’ve been forced to look for ways to find balance. It’s funny – you asked how being an entrepreneur has enriched other parts of my life, but I’d actually put it the other way around. Having kids has enriched and improved me as an entrepreneur. My kids have helped me to become a better leader, a better manager of people, and they’ve taught me a lot about how to inspire people to do their best. With four kids at home, I get to do a lot of experimenting through trial and error! At the same time, I’ve also had the privilege of working with great people in my businesses who have taught me a lot about how to better teach my own children – so I guess we’re all learning and teaching at the same time. How do you find the tech scene in Toronto? What are some exciting new changes in the startup landscape that you’ve seen there? Compared to 20 years ago, the startup scene in Toronto is a lot more vibrant. Back then, it was hard to find peers with similar challenges. You’d never find a meetup of people involved in startups, nevermind have a choice of meetups to choose from! Now there are lots of opportunities to network with others and the support infrastructure has grown enormously. For young entrepreneurs joining the startup community, there are a number of incubators and accelerator funds to support them. And we’re seeing the results with some really cool new startups coming out of Canada. The big challenge is for Canadian startups is getting to the next stage of growth investment beyond the accelerator stage; at that point, it can be tough to get investment without going down to the US. Best business advice you ever received? You’ve made a lot of mistakes already – why stop now? Where can our readers reach out? 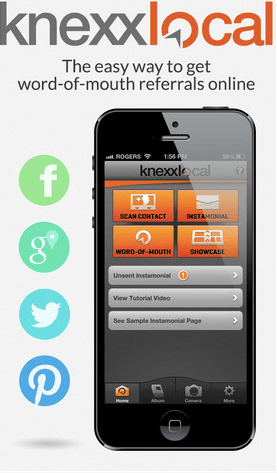 Visit our website for additional information on KnexxLocal and Instamonial, or email info [at] knexxlocal [dot] com.